So this is my LAZY ranch. 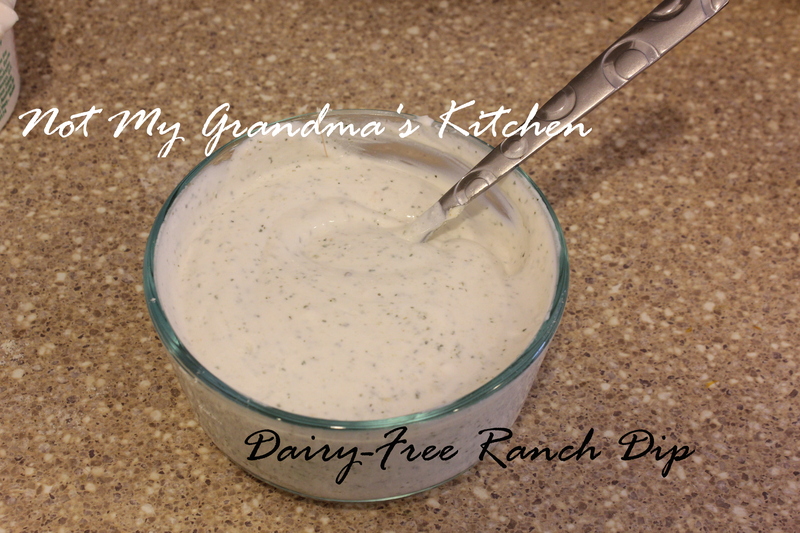 I’ve got an even better ranch coming up, but this is simple and quick. The most important thing is to read every label. Hidden Valley Ranch packets are not dairy free. Many people do not feel comfortable with store brands of seasoning packets due to concerns of cross contamination. My dairy allergy isn’t life threatening, so I tend to be flexible with cross contamination. So all you need is a packet of ranch mix with no dairy listed on the ingredients. Our local grocery store carries a version. You’ll also need your favorite dairy-free sour cream substitute. Toffutti is easy for me to find at my local specialty grocer, and so I usually get that. This is crazy simple. 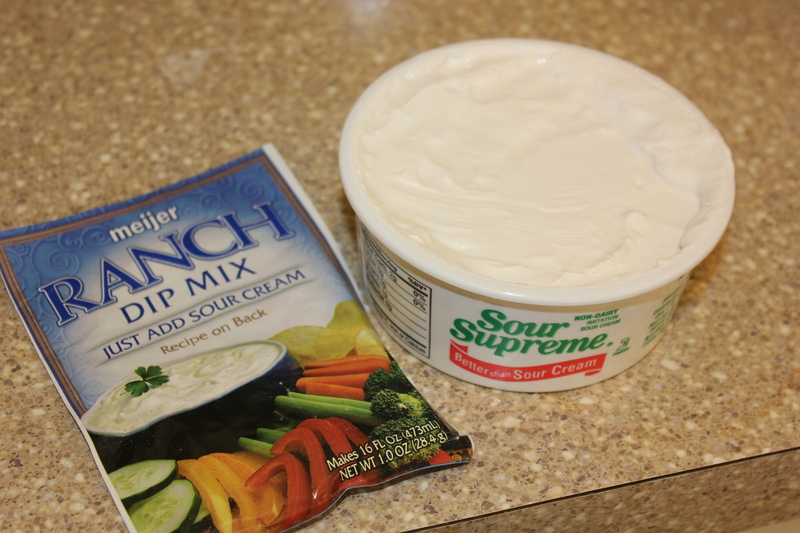 You dump the packet into a bowl and then add the sour cream. Mix until it’s smooth. This dip is absolutely perfect for dipping veggies or chips. 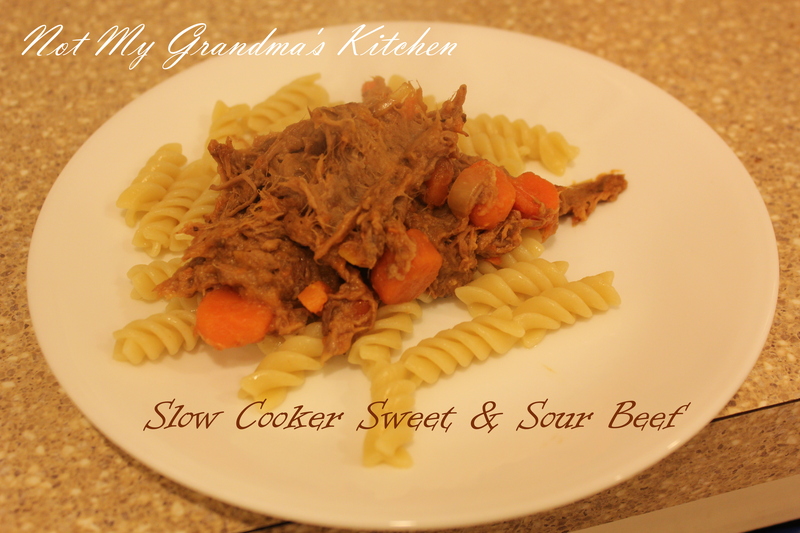 This recipe was originally features on Make Mend Grow as a guest blog post. In this recipe, the eggs make a beautiful binder to hold the toppings on, just like cheese would do. 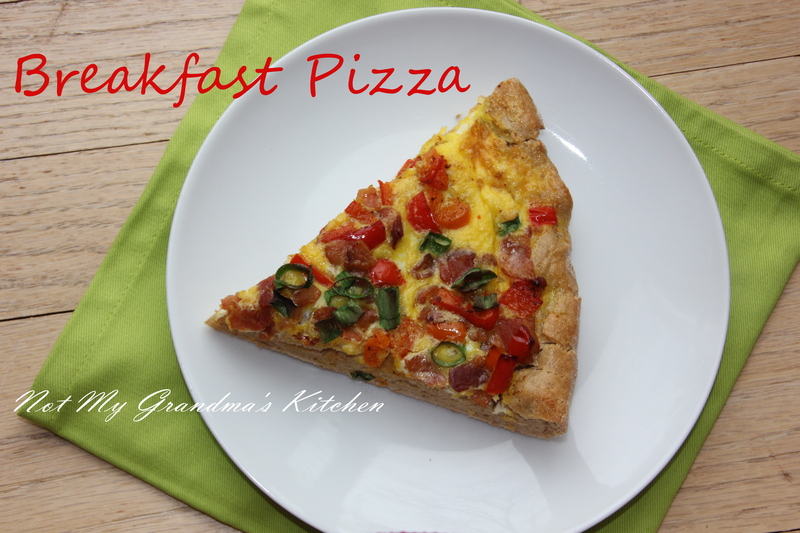 It’s flavorful and can be done with whole eggs or scrambled eggs. My toddler loves scrambled eggs, so that’s what I went with. The key to getting this recipe right is making sure the crusts of the pizza dough extend high enough to keep your eggs in. Add the eggs slowly to be sure they don’t spill over and keep it just under the top. When the eggs are cooking they expand, and they have the potential to drip over in the first part of cooking. I highly recommend cooking on a tray with edges the first time or two, so if the eggs to spill over, they are caught on the tray, and not on the bottom of your oven. 1. Preheat the oven to 425 degrees. Mix the warm water, dry yeast, and sugar/honey until the yeast dissolves. Set aside on t the stovetop for about 10 minute, until the mixture becomes foamy. 2. In a large bowl, a stand mixer with a dough hook, or a food processor with a dough blade, add the flour, water mixture and the oil. Mix until the ingredients are mixed consistently. The dough should be only slightly sticky. If it seems too wet, you can add a tablespoon extra of flour at a time until it reaches the desired texture. Place in a bowl (I like to lightly grease it with oil), cover it with plastic wrap, and set back on the stove for 15-20 minutes. 3. Once the dough has risen, drop it out onto a floured surface and kneed a few times, adding additional flour as needed to prevent sticking. Roll out into a circle, until the dough is about 1/4″ to a 1/2″ thick (depending on how you like it). At this point I transfer the dough to a baking sheet. Fold the edges upwards or roll them inwards to create a thick crust so the eggs won’t run out. 4. Place the crust in the preheated oven for 10 minutes. 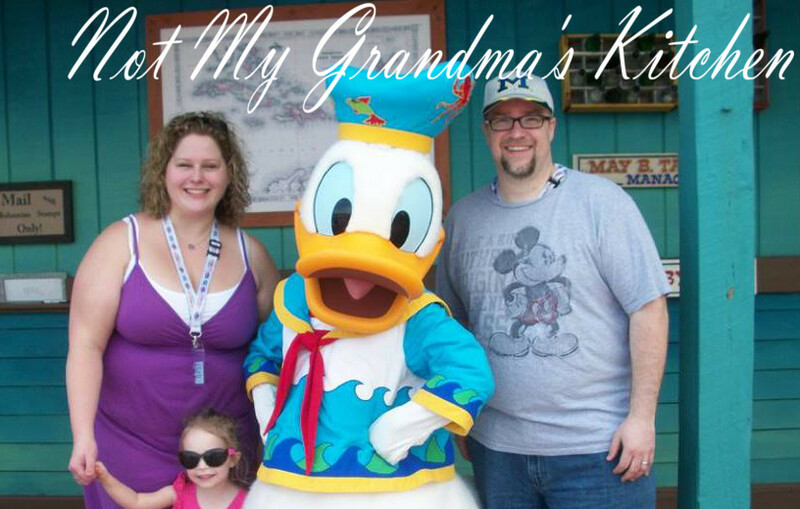 In February my family and I traveled to Miami Florida and boarded our second Disney cruise. It was so nice to have a tropical vacation and leave the single digit weather far behind. This was my second cruise, and my second cruise since getting diagnosed with food allergies. The first went well, but I felt like I was much more limited than I needed to be in the dining rooms, and ended up eating more at the buffet than I should’ve (for safety sake). Thankfully, my allergies are not currently life threatening. Below are my tips for a successful trip. My family with Donald on Castaway Cay. 1. Tell them right away. Call Disney ahead of time. Let them know to put it on your reservation. When you board you can go straight to a couple of places for lunch. Ask the staff for the choice that will allow allergy friendly choices. Once you’re seated, tell the staff immediately. At dinner the first night, you’ll meet your servers that will be attending to you the rest of your dinners for the duration of the cruise. Tell them. They’ll remember. At breakfast and lunch each day, you’ll have different servers (if you’re lucky it’ll be the same as your evening). Typically they’ll ask about allergies before you order, but don’t wait, tell them first. If you are comfortable with your night servers, ask them where they will be the next morning. You can preorder meals. They can give you the menu for the next breakfast/lunch/dinner, and you can figure things out ahead of time. On our first cruise I took advantage of this. 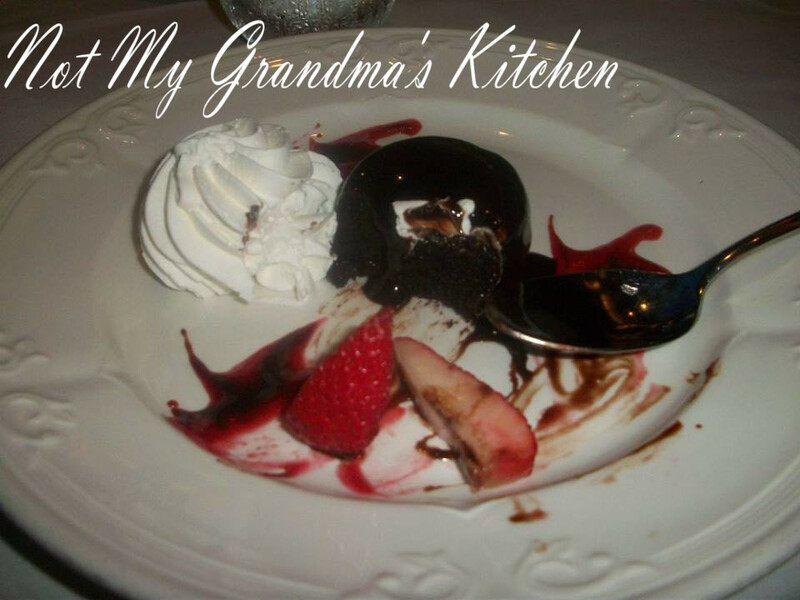 This time there were many more options on the menus that were initially safe and only needed to be prepared in a clean area that I waited until the meal to choose. I personally never experienced an issue with our servers that made me feel unsafe, but if you feel like they don’t understand, ask to speak with the head server. 2. Work as a team with the server and chef. Our first cruise I wasn’t confident about my allergies, and the server didn’t understand what a barley allergy was. He was acting in my best interest, but only served me gluten free foods. This was disappointing when I wanted pasta or couscous, which I knew was safe for me, and he refused to serve it. Better safe than sorry, right? This time around I was much more confident. It required more speaking with the server and head server, but I knew what to say when they came back with that ticket to talk to me about what I asked for. Even so, you have to be flexible and understanding that they can’t make everything safely. They are very aware of cross contamination, and if there is no way to make something safely, they won’t recommend it. Currently on the new menus they have icons that identify gluten and dairy free options. I would order those most of the time. However, there were a couple of instances that they couldn’t give me the listed salad dressing. It was listed as part of the DF/GF options, but because of cross contamination and having an actual allergy they erred on the side of caution. The best part is that they are very cautious. I’d much rather have them be overly careful than not careful enough. 3. Don’t eat at the quick service stations. Really, you probably could, but everything is in really close quarters, and they won’t guarantee that it’s made in a separate area. Why risk it? This cruise, the lady at the table next to us was upset that she felt awful after eating fries. I had gathered that she was gluten free, and she ended up speaking with the server, head server, and even one of the captain’s staff at dinner that night. They offered apology after apology, and worked her to figure out the cause. So I’m nosy, and realized that they had been in line with us earlier to meet Goofy, and I saw her eating fries from the same plate as her daughters hot dog. So the fries she had been eating were not only prepared in a non-allergy friendly area, but they were rubbing against a hot dog bun. No wonder she felt awful. So if you’re cruising with food allergy kiddos, steer clear of these areas if at all possible. 4. Don’t eat at the buffet. My confession: I did. Why? My dairy allergy isn’t life threatening. Gastrointestinal symptoms aren’t comfortable, but a little bit of cross contamination from dairy isn’t going to ruin my trip, or my life. I avoid the items I’m not sure about, and eat the things I’m sure I can have (oatmeal, sausage, bacon, fruit). The only place to eat allergy safely is the main dining rooms. At the buffets they can make certain things to order, but again they are not prepared on a cross-contamination free workspace. 5. Don’t hesitate to ask for something that isn’t on the menu. The first couple of nights I went without dessert. I don’t need it. By the third night this time around, I was a little disappointed watching my toddler chow down on yet another chocolate coated Mickey shaped ice cream bar. So I asked if there was anything they could make or do for me. I knew it was possible, since they did it without asking on our first cruise, but the staff might not have known that I did actually want dessert. I asked, and I received. Earlier in the trip they had Ahi Tuna with avocado listed on the menu, but it wasn’t clearly marked as DF. So I asked. They were able to make it safely. It was so good! This is not the Ahi Tuna. I do think it had some tuna, with Israeli couscous and topped with shrimp. What was left of my whipped “cream,” fruit, and chocolate parfait. Seriously. The food is fabulous. It’s art. They made it special just for you, and they take pride in it. The best thing you can do is enjoy it, and make sure you tell them how much you enjoyed it. I would love for making allergy friendly foods to be a regular thing, and for the staff not to go out of their way to make me dinner, but they did. All of the staff members went out of their way to make sure that my dinner was just a fabulous as my husband’s. Be humble. Be firm about your allergies, but be friendly. They really do take allergies seriously. Flourless and dairy free chocolate cake with strawberries, chocolate sauce, and whipped “cream.” One bite in. 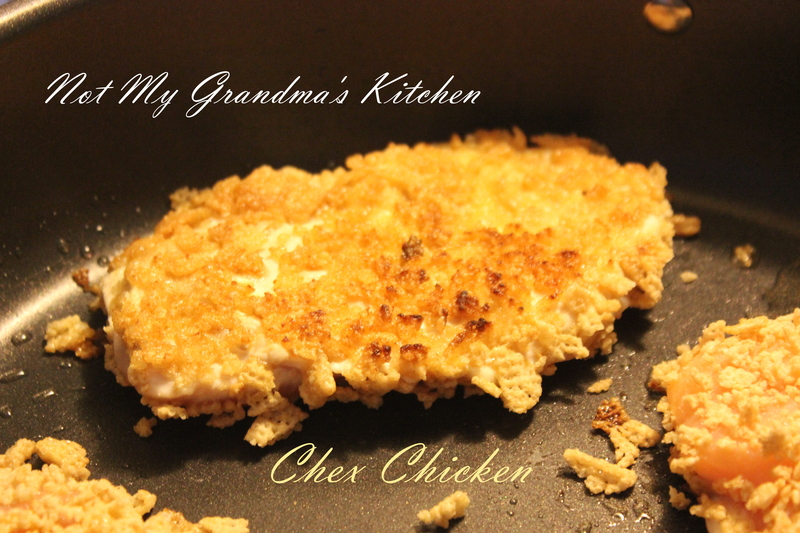 This recipe came about when I wanted to make breaded chicken, but became frustrated when I couldn’t find safe breadcrumbs at the store. Usually I’ll just make my own, but I wanted to make the chicken really quickly and have some kind of flavor added. So I started opening the cupboards trying to find something to use. One of my husband’s favorite dishes at a local restaurant is Cap’n Crunch Chicken. So when I had the cupboard open with a couple kinds of cereal, I saw the Chex. 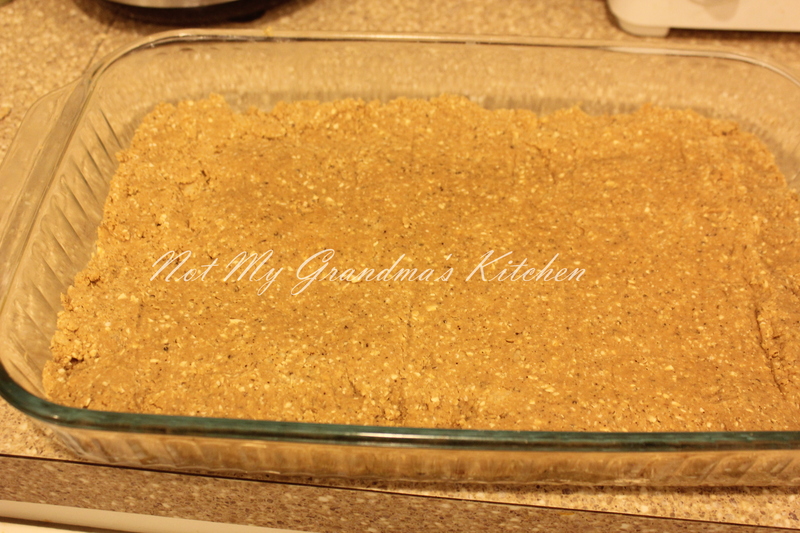 I used Rice Chex for this recipe. The Rice Chex give a slightly sweet flavor without adding too much. So I hate cooking chicken. I was never very good at it, and for the longest time it was always slightly raw in the center. I finally figured out what I was doing wrong, and I use a few tricks to stop it from happening. First, I wasn’t cooking it on a high enough heat. The outsides would become done and dry, but the middle was still pink and uncooked. I had to increase my cooking temperature a little to be sure the heat would reach the center of the chicken, but watching it closely enough that it wouldn’t burn on the outside. 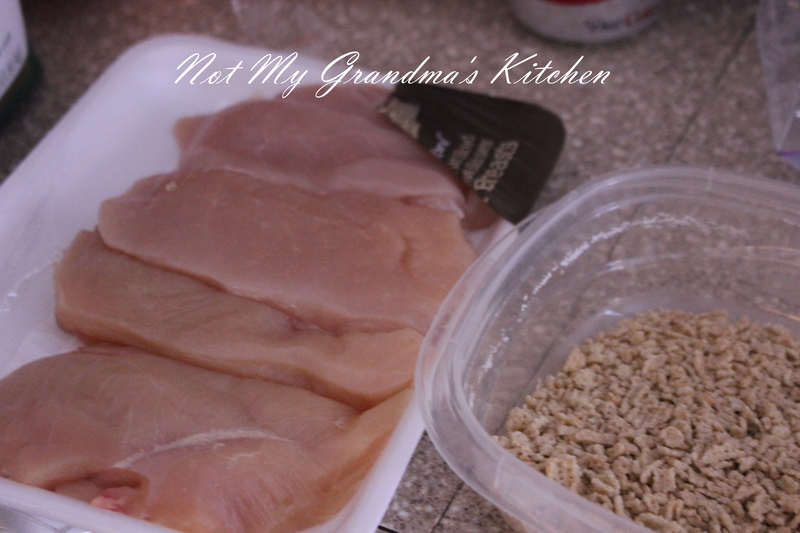 My other issue was that I usually left the chicken breast in the form it came in the package. A typical chicken breast has a thick area at the top and gets thin at the bottom. When you cook it as is, it’s really easy to overcook the thin end and not fully cook the thick end. So in order to correct this issue, I buy chicken tenderloins. They’re also breast meat, but they’re a thinner cut. It cooks faster, more evenly, and it’s a better portion size. The other thing you can do is place a chicken breast between two sheets of parchment paper and pound away. That takes too much time when you only have 2o minutes to make dinner. Third trick to making sure it’s done? A meat thermometer. This thing is a lifesaver. Try not to use it too much, as every hole you put in lets the juices out. However, using the thermometer helped me figure out how to have a better awareness of the signs that it’s done. So the first thing I do is open the chicken. I trim the fat and any ligaments that are visible. If you want to make it without eggs, be sure to rinse the chicken with water first. It’ll help the Chex stick. When I made it this time I did both without and without eggs. Both turned out really well. I found that the Chex did stick a little better with the eggs, but it wasn’t a significant difference. Put about a cup of Chex in a sealable sandwich bag and smash them as best you can. I either use my hands or call my toddler in the kitchen to take care of it for me. Crack an egg into a shallow dish and place the cereal into another. Dip the chicken in the egg, and then into the cereal. Push it firmly into the cereal and then turn and push firmly again. Place the chicken in a pan that has been preheated over medium high heat and sprayed with non-stick spray or use a teaspoon of your favorite oil. Cook each side for 4-5 minutes until internal temperature reaches at least 165 degrees. 1. Put the cereal in a sealing sandwich bag and smash into pieces. Add the cereal to a shallow dish. 2. Crack an egg and lightly scramble in another shallow dish. 3. Dip the chicken in the egg and coat both sides. Then place the chicken into the cereal. Firmly push down to help the cereal stick to the chicken. Flip and firmly press down again. 4. Place the chicken in a large skillet, with 1 tsp. of oil or cooking spray, over medium high heat. Cook chicken 4-5 minutes each side, or until meat thermometer reaches 165 degrees Fahrenheit. Tips: Leave the egg out if you want. The cereal may not stick quite as well, but then it’s safe for egg allergies. I highly recommend using a meat thermometer. It’s the best way to be sure the chicken is fully cooked. This is not a good recipe to make ahead. The cereal gets crispy during cooking, and does not reheat well without drying out or getting soggy. Last year my husband and I joined a gym, and he started participating in a weight loss program. One of his biggest mistakes with working out and eating healthier was not having breakfast. He would do great with lunch and dinner, but wasn’t really consistently losing weight. Until he added in breakfast. 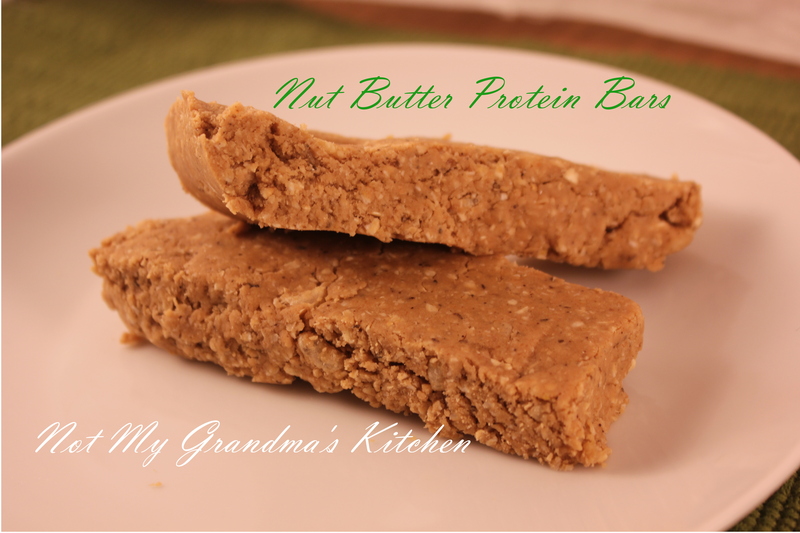 I found this recipe by Oh She Glows: Peanut Butter Protein Bars and immediately fell in love with it. The only issue I found was that it didn’t make enough, and when I doubled the batch, the consistency changed and I ended up with dry bars. Also, no chocolate. So I doubled and modified to find the best fit with the least amount of sugar since my husband has been diagnosed with diabetes. First, you’ll put the 3 cups of oats in a food processor. Blend until it’s a consistent flour like texture. A few bigger chunks are fine. Pour that into a big bowl. Add all the dry ingredients and mix. Then add the rest of the ingredients. You can use a big spoon but I find this is another recipe that does best when you use your hands. This way you can feel how dry the mixture is and when to add more dairy free milk. 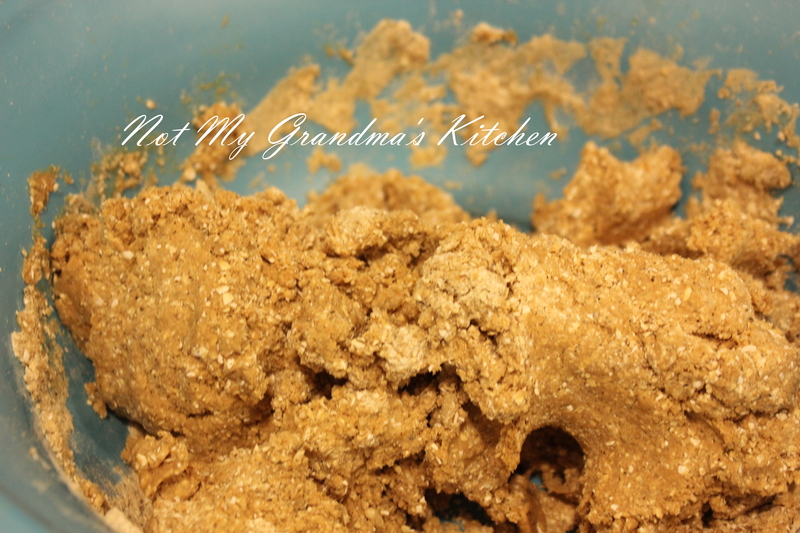 About the nut butter: My husband is a huge peanut butter fan, so that is what is pictured. However, the recipe is just as good with almond butter, sunflower seed butter or cashew butter. Once it’s become slightly less sticky and will stay in a ball, transfer it into a 9 x 13 pan sprayed with non-stick spray or lightly rubbed with coconut oil. 1. 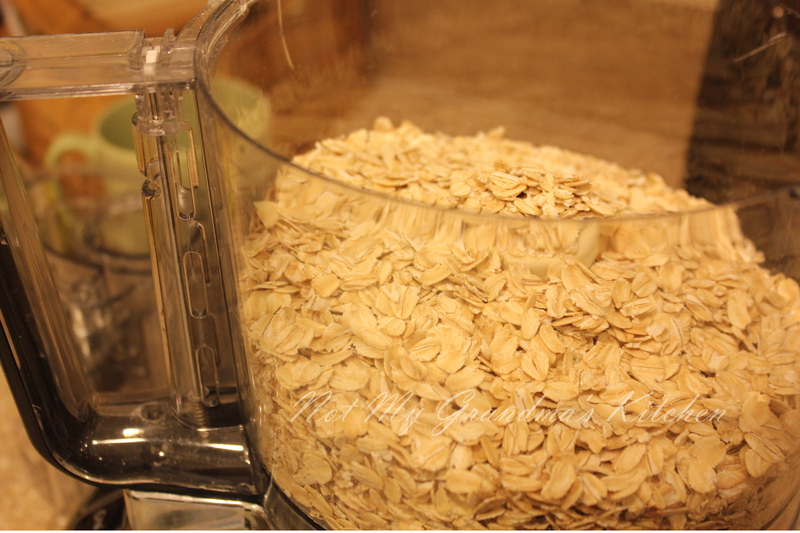 Blend the oats in a food processor until the they are mostly a flour consistency. 2. Add the oats, protein powder, and cereal and mix. 3. Add the nut butter, honey, and almond milk and stir with a large spoon or your hands. If the mixture is still dry, add extra milk a tablespoon at a time. 4. Press mixture into 9 x 13 pan. It can be cut immediately but cuts even better when allowed to refrigerate for an hour first. 5. Cover 9 x 13 pan OR place 1-2 bars each in snack size bags and put them in the fridge. Then you can take them out as needed, and will be more likely to grab them instead of a processed packaged snack in the cupboard. You can line the pan with parchment paper before you add the mixture. This makes it really easy to remove them from the pan. This is not the prettiest dish, but I promise it’s worth giving it a shot. It’s sweet, slightly tangy, beefy goodness. The toddler in this house loves this. 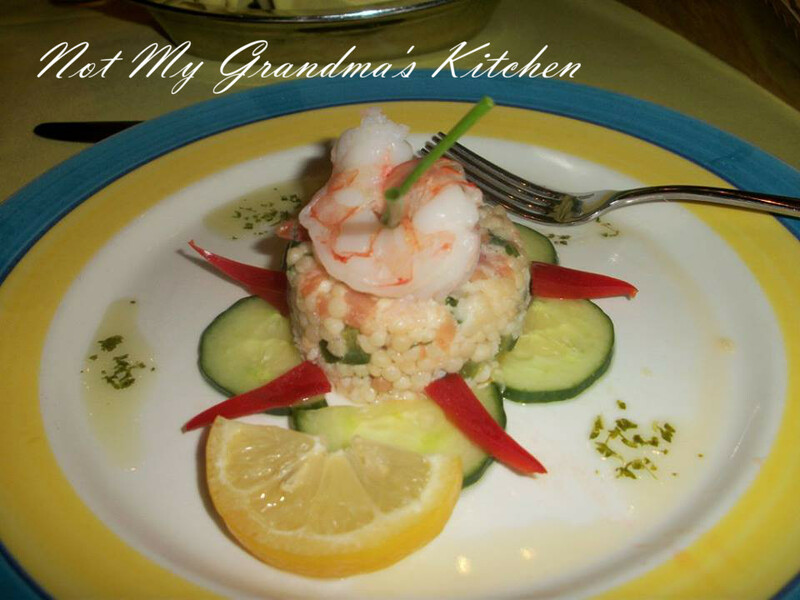 It was inspired by a dish my husband’s mother used to make. Every time he would tell me about the sweet and sour beef, I pictured the sweet and sour sauce you find at Chinese restaurants poured over chunks of beef. Gross. So it took me about 9 years of hearing about the sweet and sour beef before giving him a chance to explain what it was. It’s a tomato based sauce, with some brown sugar, vinegar and carrots cooked with the beef. His mom always served it over pasta, but I’m sure it would also be pretty tasty next to some caked potatoes or mashed potatoes. The best part? SLOW COOKER. I can put everything except the pasta in and it’s ready when we get home from a busy day. 1. Cut the beef into around 1″ cubes. Don’t be fancy, it’s all going to fall apart once it’s cooked. Chop the carrots into about 1/4″ slices. Or however you like. Chop the onion into small pieces. 2. Put the beef on the bottom of the slow cooker, add the tomato sauce, brown sugar, and vinegar on top. Don’t worry about mixing too much. Sprinkle the onions and carrots on top. Put the lid on a set for 6-8 hours (6 hours high, 8 hours low). 3. During the last 15 minutes of cook time, start cooking the pasta according to the box’s directions. 4. When the beef is cooked tender and falls apart, add the tapioca starch to the crock pot and stir it up. Leave on low for a couple of minute until the mixture thickens. 5. Spoon the pasta onto the plate and spoon the beef mixture over it. Enjoy! If you don’t have tapioca starch you can use corn starch instead. Or regular flour. Anything that’ll absorb some of the liquid to thicken it up. Add a teaspoon at a time until you get the desired thickness. Cheap cuts of beef are perfect for this recipe, since the vinegar and the length of cook time softens the beef really well. Don’t add any extra water to the crock pot. The beef will let some juices out and the tomato and vinegar provide enough liquid. You really can put the stuff in any order in the crock pot. I like the vegetables on top so they get steamed. Some people like them on the bottom so they keep the meat off the bottom of the crockpot. 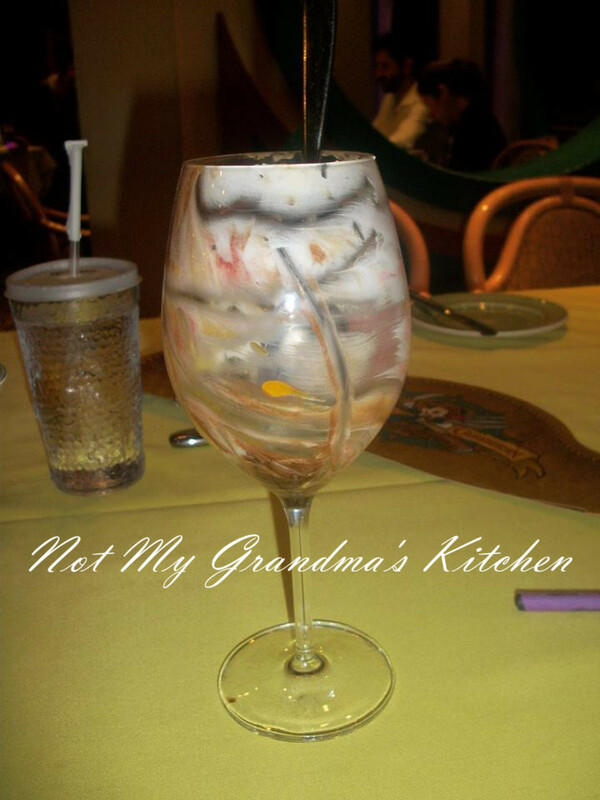 * You may notice that some of my recipes are gluten free, and some aren’t. If you’re wondering why it is because I am only allergic to barley. I can have wheat. So regular pasta is safe for me because it’s typically made from only wheat. I like to dabble with completely gluten free recipes too, so most recipes have a gluten free option. For more information about barley allergies, see the link at the top of the page. I started making this when my husband was wanting to start eating healthier and getting more vegetables in his lunch. This was a big deal because most of his co-workers were eating out on a daily basis. My husband enjoys vegetables, but prefers a variety of flavors. So after finding some ideas online, I created my own version of a bean salad. It’s colorful, flavorful, and pretty quick to prepare. Once prepared, I place it into single serving sized containers and place them in the fridge, so they’re quick and easy to pull out and pop in a lunch bag. First you’ll cook the green beans. If you buy fresh unpackaged green beans, make sure to pull or cut all the ends off of the beans prior to cooking. Chop them into 1-2″ pieces, and slide them into boiling water. When I buy the prepackaged fresh green beans I just cut them into pieces. While the beans are cooking for about 5-8 minutes, I take that time to cut up the rest of the vegetables and prepare the beans. Cut up the yellow and red peppers, into small even chunks. Cut up an onion into small pieces. Open two cans of different types of beans, and rinse them well. Drain the green beans when they are fork tender, and return them to the pan. Add all the other vegetables. Add 1 tbsp of vegetable oil and 1 tsp of Italian seasonings. Mix or toss well. 1. Bring about 4 cups of water to boil in a large pan. Add the cut green beans into the water and cook for 5-8 minutes, until they’re fork tender. Drain and return to the pan. 2. While green beans are cooking, cut peppers and onion into 1/2″ or smaller pieces. Open, drain and rinse the cans of beans. Rinse them well with hot water. 3. 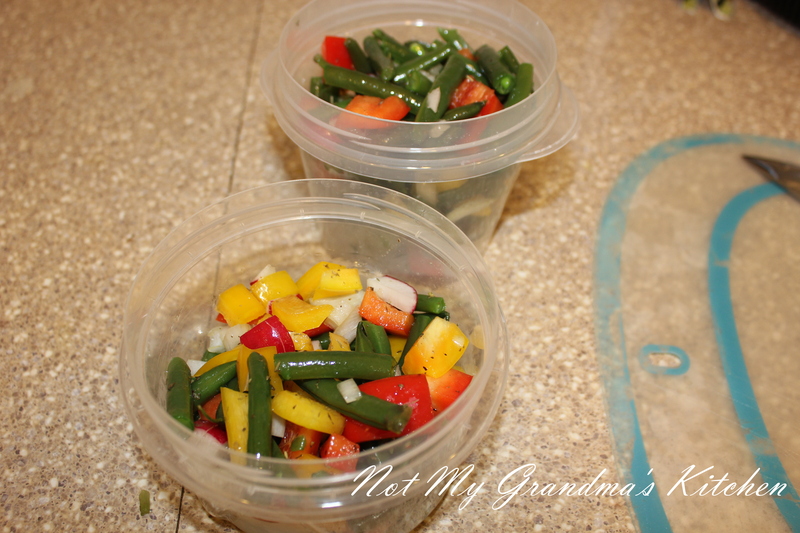 Add peppers, onions, oil, and seasonings to green beans. Mix or toss well to coat evenly with seasonings and oil. 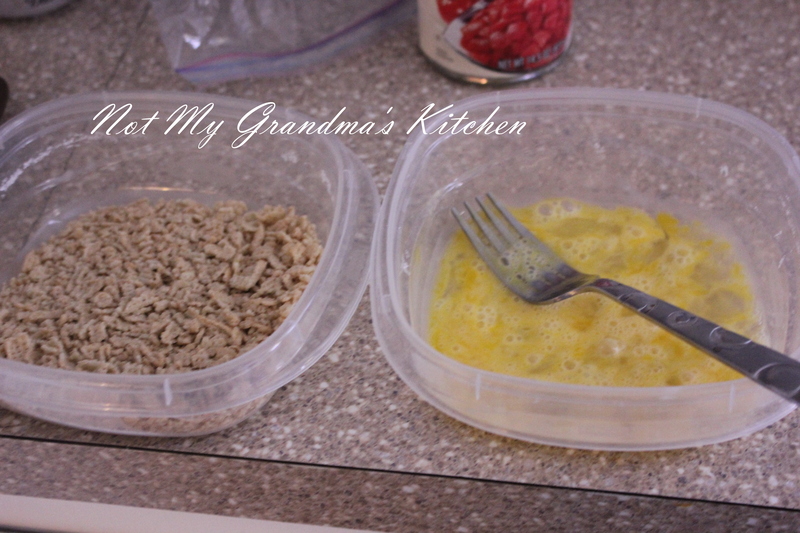 We split this into serving size containers to make them easy to put into lunch boxes. Enter your email address to follow my blog and receive notifications of new posts by e-mail.